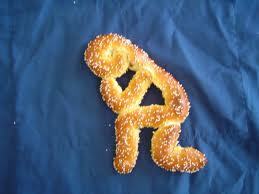 Why did you tie him to a pretzel? Jacob why did you tie Brian into a pretzel? I like your funny pretzel. Can you make me ten tons of pretzels? I liked the pretzel shop idea. I liked your funny pretzel. warm pretzels are delicious! Do you want to be a chef like Brian?